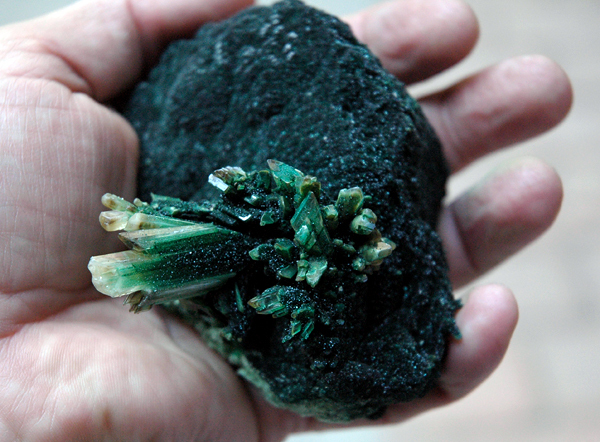 We have very recently described a huge pocket covered with baryte and marcasite that was found in the Lubin copper mining area in Poland (see this text here), and now we want to present another interesting news from the area! 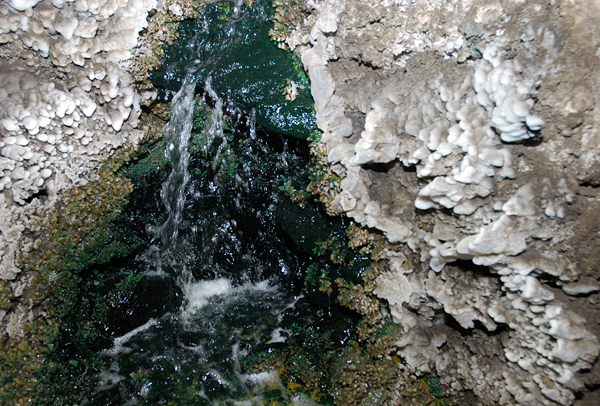 This time our friends discovered a small lake with a “waterfall” with very interesting mineralizaton. 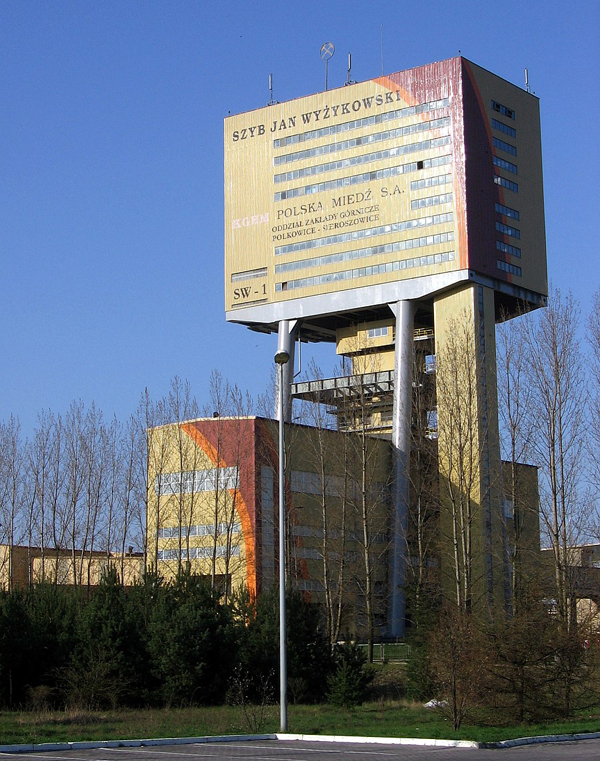 The find took place in Polkowice mine, West shaft, in one of the old, abandoned sectors of the mine. The lake and waterfall were formed on a small dump built of sandstones. 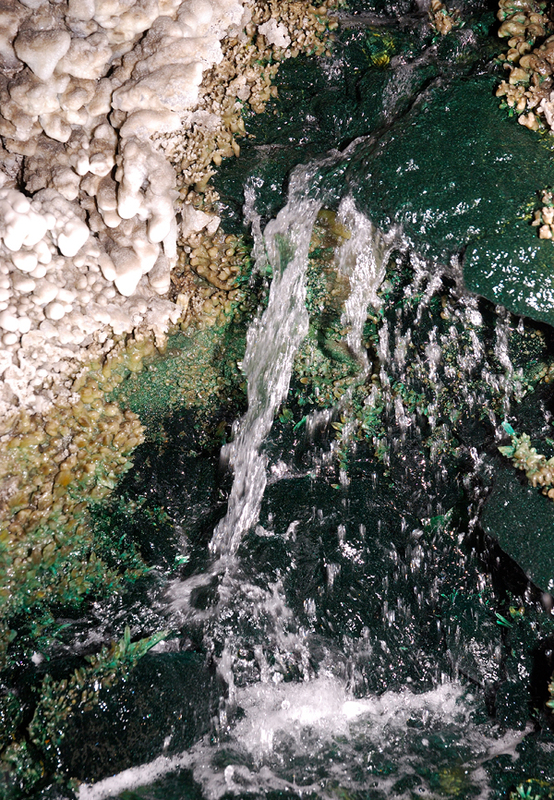 The area where water was moving fast, within the small waterfall, the whole bottom of the stream was covered with deep-green small sparkly crystals. 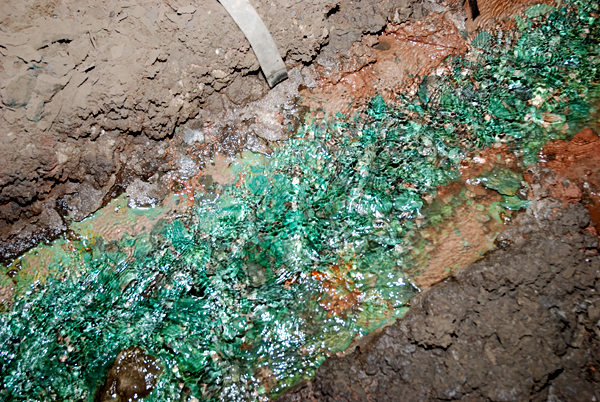 The size of crystals is less than 1 mm and they cover the surface of pieces of sandstone building the dump. 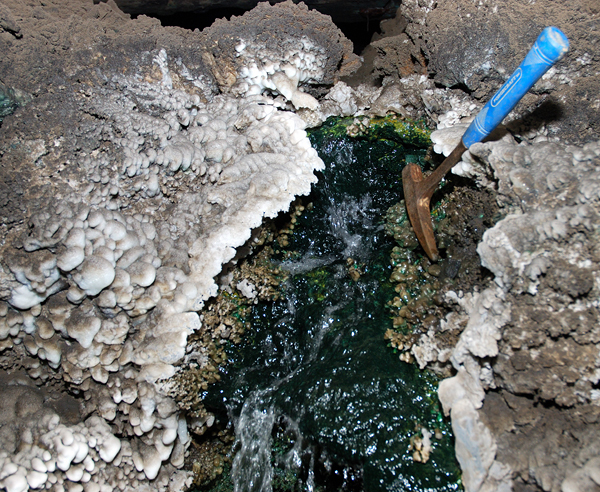 What is more there were kidney shaped and “mushroom shaped” gypsum that crystallized on the edges of waterfall, and on small islands in the stream. 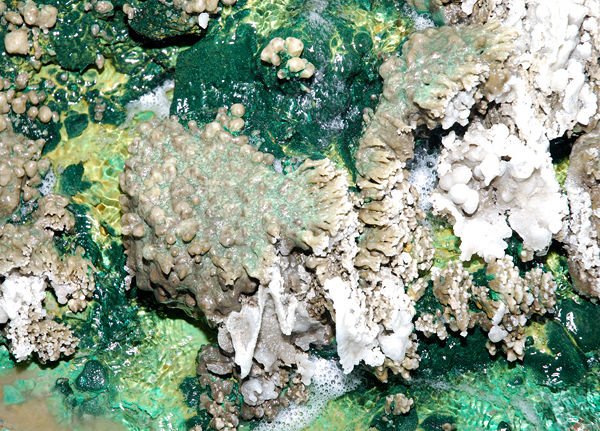 In other places gypsum was formed as typical prismatic crystals, frequently twinned. Just above the waterfall mineralization disappeared. 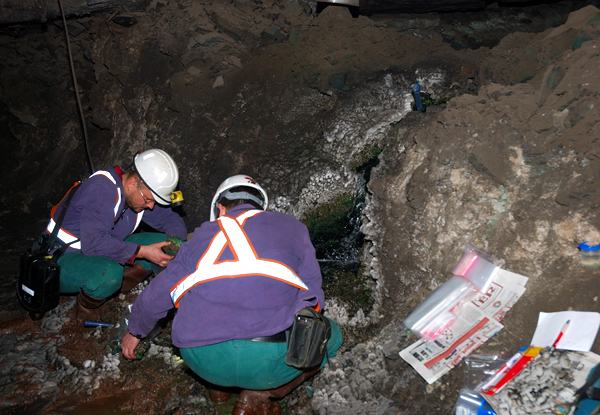 During their stay in the mine there was collected several dozens of specimens and number of samples for analyzes. 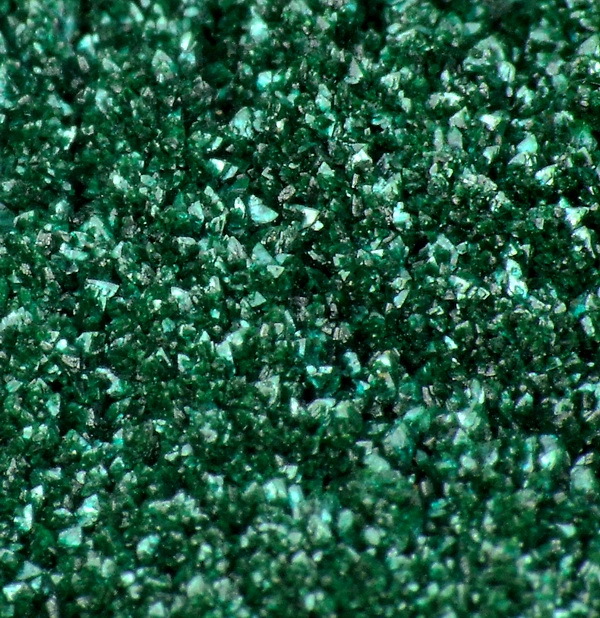 After coming back to the lab mysterious green crystals were analyzed and it turned up it was a mixture of minerals from the group of atacamite: botallacite, atacamite and paratacamite. 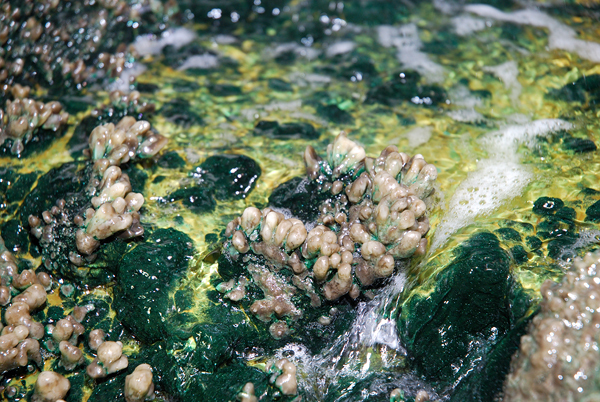 There will be a scientific article about those minerals published soon, if you are interested in reading it please send us an email (here). 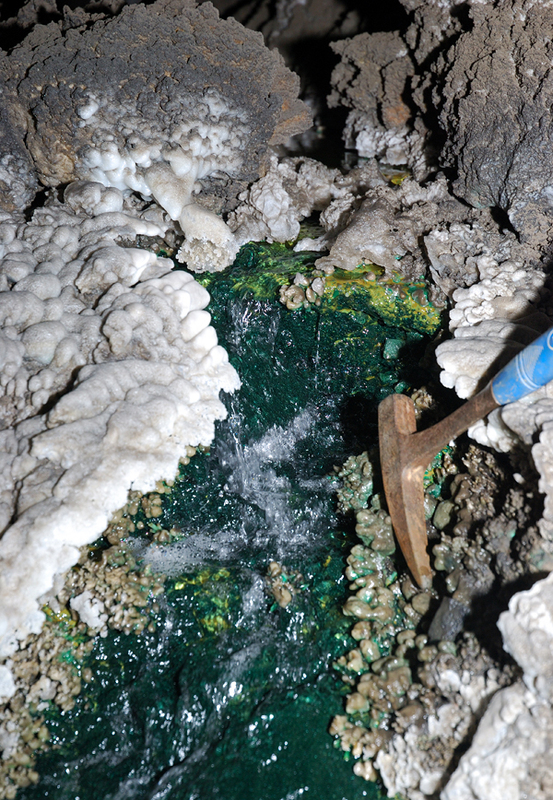 It is clear that this small find can not be classified as a “world class” but surely it is an unique opportunity to see recently crystalizing minerals (they are still growing there!) and good photos of the locality! 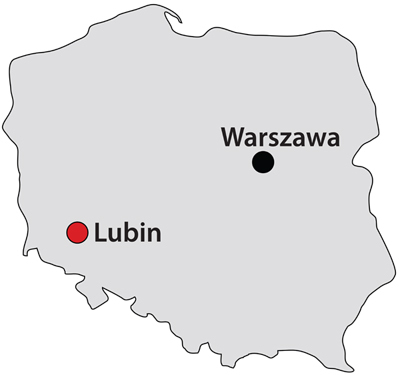 Map of Poland with, the location of Lubin mine is marked. 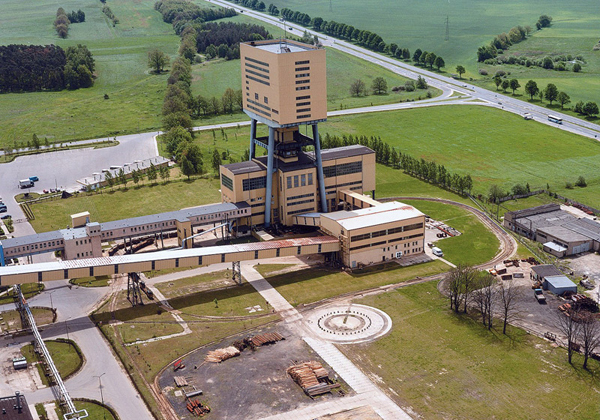 Aerial view to the headframe of Polkowice mine. Little waterfall going down from a small dump. 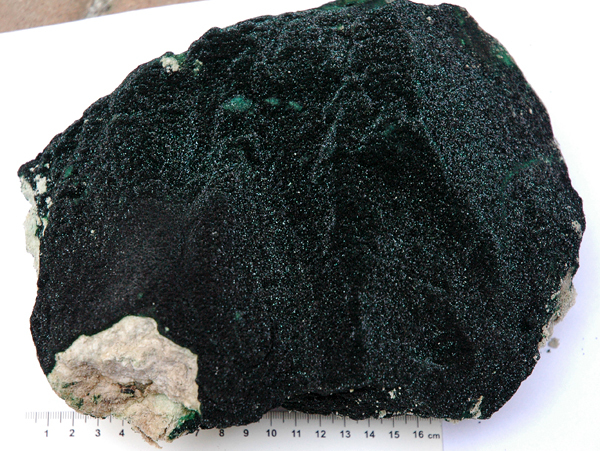 Bottom of the stream is completely covered with botallackite-atacamite-paratacamite. 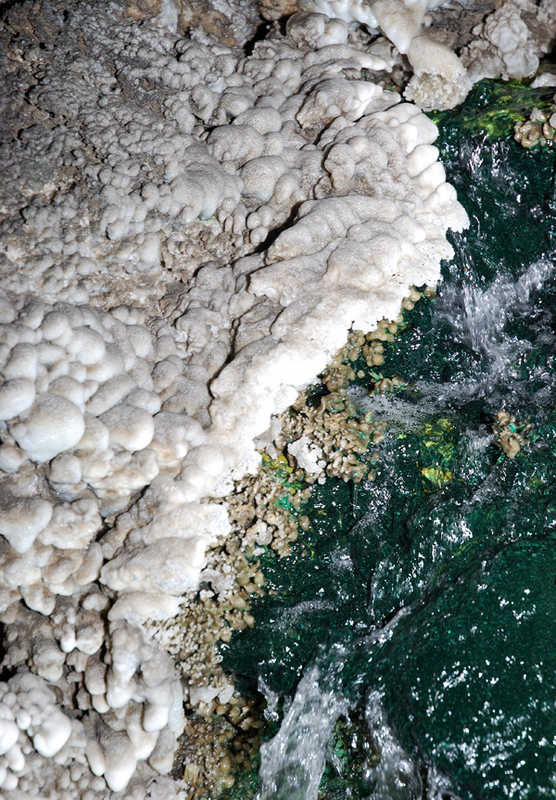 Waterfall with gypsum on the banks. 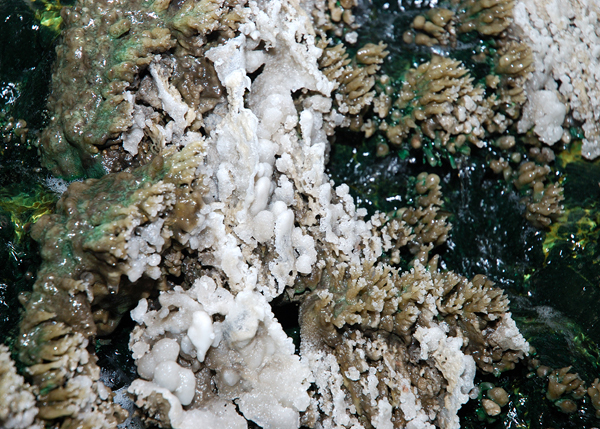 gypsum island in botallackite lake . Very interesting shapes of gypsum. Marek and Jaroslav collecting samples. 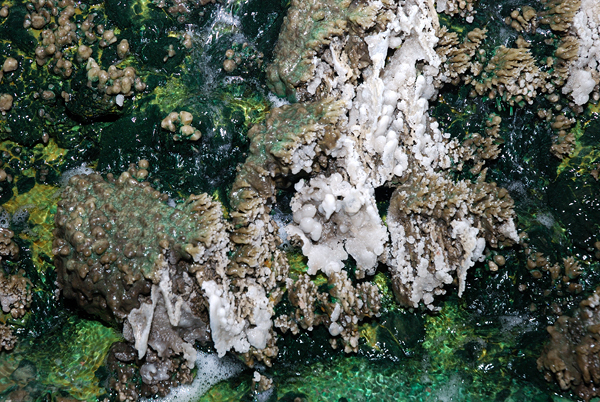 Gypsum crystals with botallacite and co. A. Piestrzynski photo. 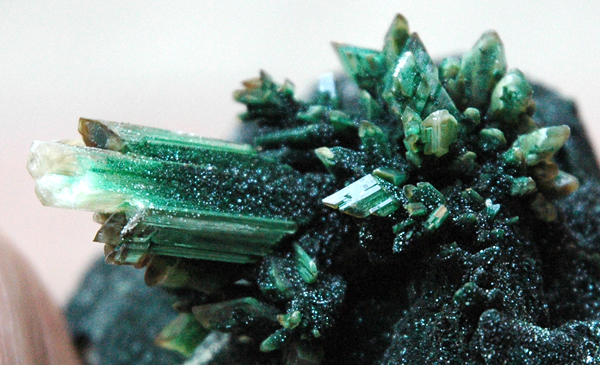 Close-up of botallackite-atacamite-paratacamite crystals. G. Bijak photo. Another view to botallackite waterfall and gypsum surroundings. 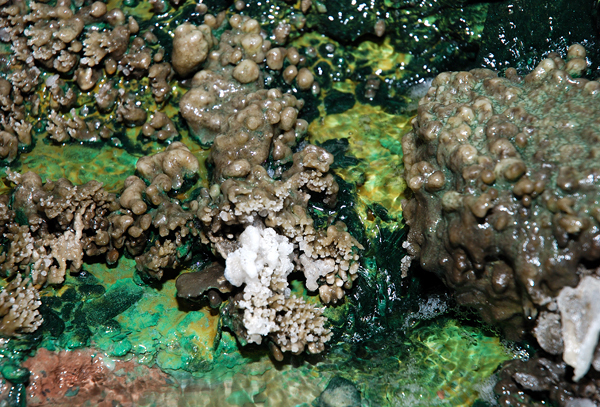 Gypsum and botallackite make really beautiful contrast. 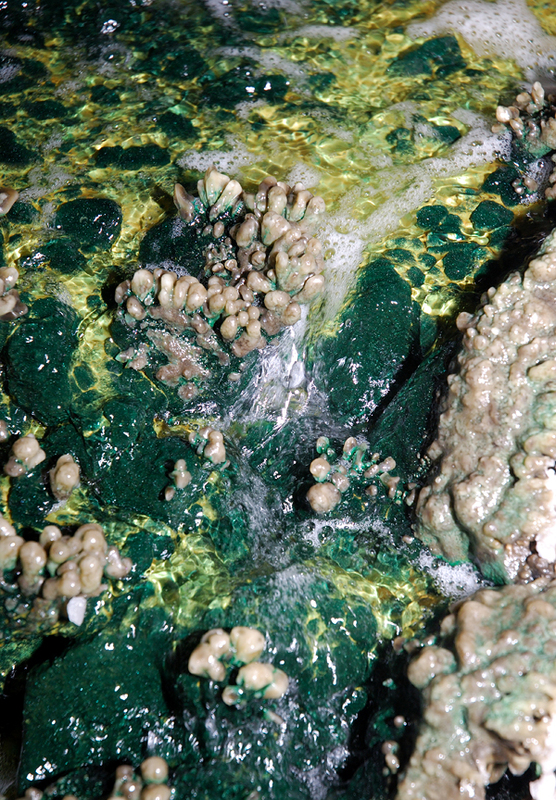 Gypsum "islands" in "botallackite stream". 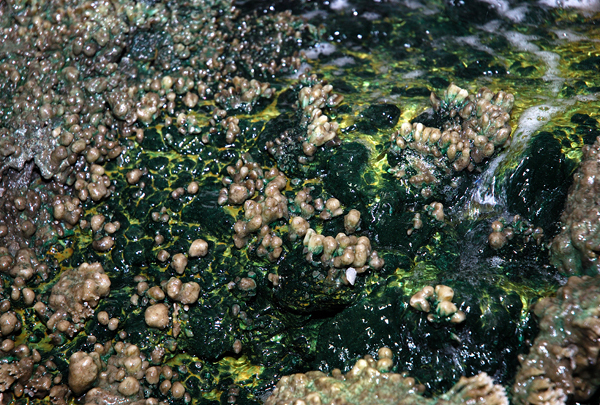 Sandstone covered with botallackite & co. A. Piestrzynski photo. 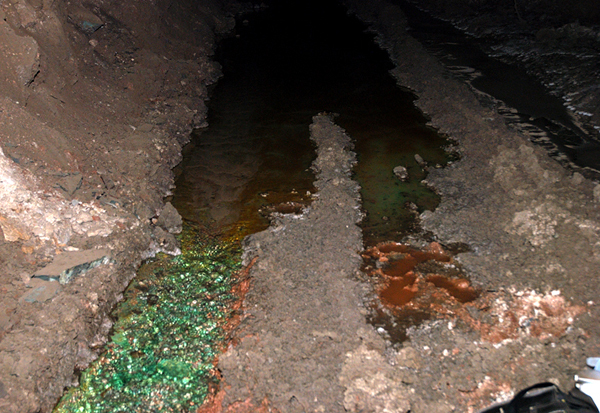 ... finally green botallackites deaspear.